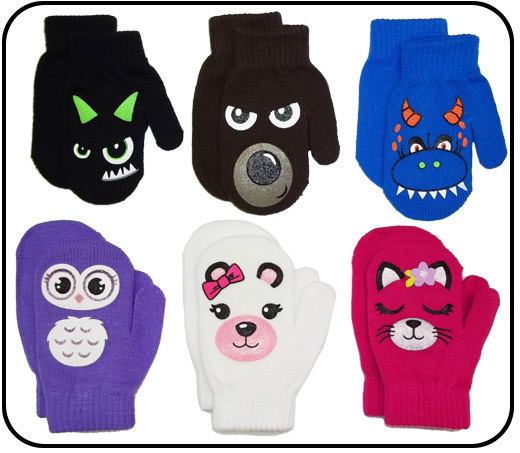 These quality soft and warm stretch mittens are manufactured out of a balance of 90% Acrylic and 10% Spandex. They all feature a (heavy screen printed) image on the outside (back of hand). The images are multiple colors and look really cute and clear. The wrist areas of the mittens have an elastic cuff. Designed to stretch and fit a child between the ages of (4 months old to 6 years old). They are machine washable and can be put into a dryer with no problem at all. A quality item that is hard to find. Very cute colors and matching art work. Please see photo – Top row to bottom row - going from left to right.